Madison is a friendly and active city located in south-central Wisconsin. Not only is Madison the capital of our great state, it is also our state’s second largest city. 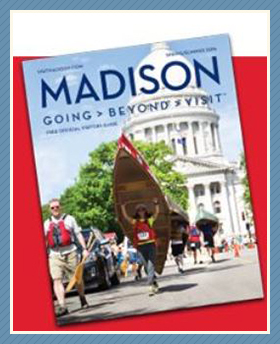 There is so much to see and do in Madison. Check out some of the fun activities our area has to offer. Wisconsin State Capitol and State Street: The Capitol building is open to the public for free tours daily. The State Street pedestrian mall links the Capitol to the University of Wisconsin campus. Henry Vilas Zoo: This free zoo features animals from around the globe and is dedicated to building understanding between people and animals by promoting conservation. Madison Children’s Museum: Come and play at this great family museum. It is open daily (excluding certain holidays) for a nominal admission fee throughout the summer and Tuesday through Sunday the rest of the year. Madison Farmer’s Market: The largest producer-only farmer’s market in the U.S., this outdoor market is open each Saturday from mid April through the beginning of November. Olbrich Botanical Gardens: A popular attraction in Madison, the gardens are an oasis of green on 16 acres. The outdoor gardens are free and open daily, and the conservatory has a small admission fee. Overture Center for the Arts: The Overture Center presents a wide variety of music, theater, and dance performances.